Got some great email from editor Stephen Wacker today, who wanted to share some artwork from the next issues of DAREDEVIL and END OF DAYS. Hope you guys enjoy these sneak peeks and a big thanks to Mr. Wacker for sending the pics my way to post here for all of you to check out. 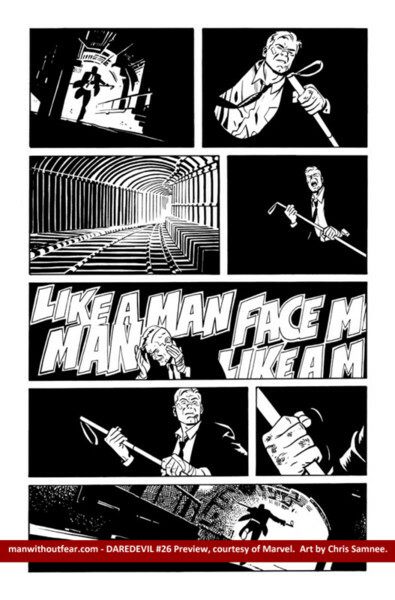 First up is an inked page from DAREDEVIL #26 by Chris Samnee! 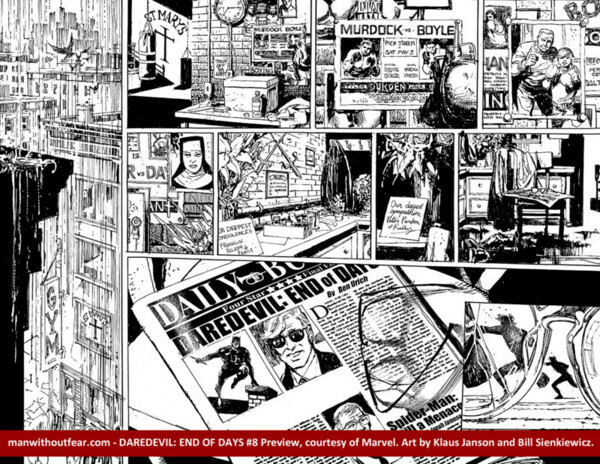 And next is a double-page spread from DAREDEVIL: END OF DAYS #8, by Klaus Janson and Bill Sienkiewicz! DAREDEVIL #26 ships May 22 and DAREDEVIL: END OF DAYS #8 ships May 29. And big thanks once again to Stephen Wacker for the pics.